The upcoming Halloween holiday brings to mind candy and costumes and ghosts and ghouls and witches. This year, witches and witchcraft have enjoyed an additional autumnal limelight after tapes surfaced of U.S. Senate candidate Christine O’Donnell (R-DE) claiming to have dabbled in witchcraft while in high school. 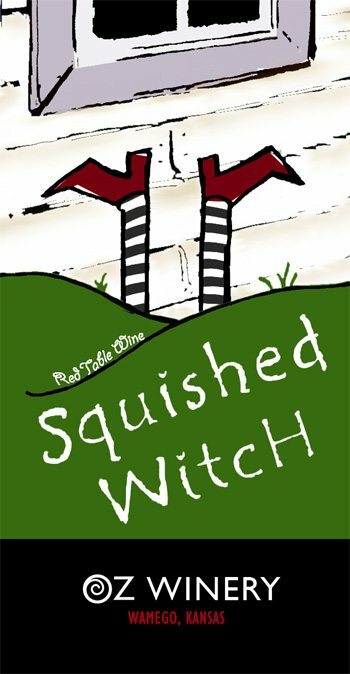 Squished Witch, from Oz Winery of Wamego, Kansas, looks set to capitalize on the shared whimsy of this year’s Halloween and political seasons. The winery describes Squished Witch as a “fruity, semi-sweet Ives Noir based red.” Like Squished Witch, most of the three-dozen wines in the Oz Winery stable boast some obvious connection to the classic film The Wizard of Oz, including I’ve Got You My Pretty, The Lion’s Courage, The Wonderful Wizard of Oz, Scarecrow, Flying Monkey, and I’m Melting Merlot. The Squished Witch label is home to at least one interesting legal issue. If you were looking for the class/type description and/or alcohol content and weren’t having any luck, note the smallish cursive words “Red Table Wine” nestled in a fold in the land above the fanciful name. I missed them at first, second, and third glance. Oz also has Drunken Munchkin, and it’s rare to have a reference to intoxication on a wine label.